The iSpot is the advancement of the classic enzymatic EliSpot technology for measurement of polyfunctional T-cells against a specific antigen. 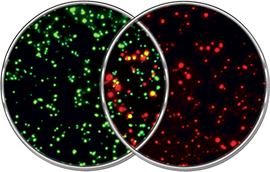 The AID iSpot Assay detects 2 or 3 cytokines in parallel in one well. Different combinations of cytokines allow depending on the question a detailed evaluation of the immune status.